Gmail on mobile will soon get a new look. 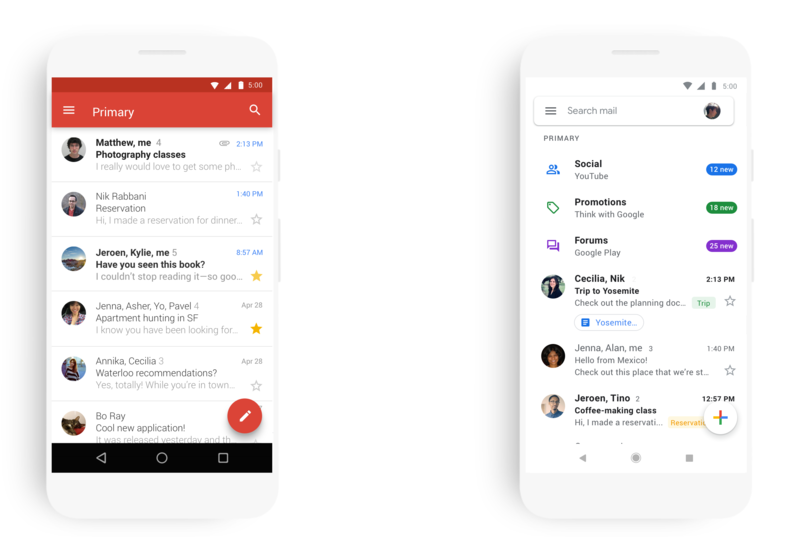 Google today announced that its mobile email apps for iOS and Android are getting a redesign that is in line with the company’s recent Material Design updates to Gmail, Drive, Calendar and Docs and Site. Indeed, the new UI will look familiar to anybody who has ever used the Gmail web app, including that versions ability to select three different density styles. You’ll also see some new fonts and other visual tweaks. In terms of functionality, the mobile app is also getting a few new features that put it on par with the web version. I’ve been testing the new app for a bit and quickly settled on the comfortable view since I never found the attachment chips all that useful in day-to-day use.